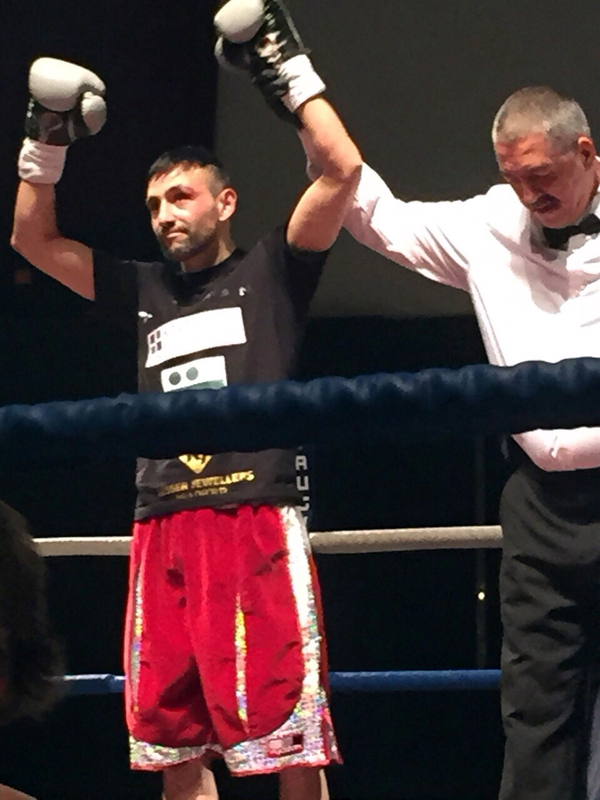 London – Tuesday, 24th March 2015 – On Friday evening Bradford’s Tasif Khan scored another sensational first round stoppage win, this time over Czech Republic’s Ladislav Miko, on the Stephen Vaughan promoted RED MIST event at the Grand Central Hall in Liverpool. From the opening bell it was Miko that was the more aggressive, taking the fight to Khan, however in doing so the Czech fighter played straight into the Bradford man’s hands. Khan had expected Miko to start fast and as such when the Czech fighter advanced rapidly, Khan simply danced to the side and let rip with a shot to the body. Miko’s body language made it quite clear that he had been hurt, so no surprise that when he came in hard and fast again that the savvy Khan utilized a similar tactic, this time slipping to the right and letting rip with another body shot, followed up by a scintillatingly fast double handed salvo to both body and head. On around the forty five second mark, Miko, who clearly hadn’t learned to be a little cautious, made yet another forceful attack, this time though Khan threw out a solid jab, followed by an uppercut and then just planted his feet and put full power into a lightning fast left hook, to send the Czech lad to the canvas. Miko managed to make the count, but seconds later walked straight into another big left to the body. This time Miko really struggled to make the count, just managing to do so but was very unsteady on his feet, leaving referee Jimmy Byrne no option but to wave the bout off on the one minute and fifteen second mark of the first round. Immediately after receiving the victor’s laurels Khan was informed by his team that he would get to challenge for his first Championship accolade, the International Masters Bantamweight title, on his next planned outing, which will be on the Billy James-Elliott and Mark Lyons promoted LORD OF THE RINGS event at York Hall in London on May 2nd. Following receiving this news Khan spoke briefly about the fight as well as his upcoming title fight. “Yeah brilliant, it was just brilliant. I can’t complain that he didn’t last a round, I would have preferred it had gone on a bit longer, I mean it was a six rounder and I really would have liked to get some rounds under my belt, but as I’ve said before you don’t get paid overtime in this game. We knew that he would start fast and rush in and the plan was to work off my jab to slow him down, basically to try and get the six rounds under my belt. It didn’t quite happen that way as he really came at me much quicker than expected, instead I adapted and caught him with a good shot, I see his legs buckle a bit but he stayed on his feet. He’s a game fighter, most people would have backed off to give themselves time to recover, not him he came back at me hard again, which gave me the opportunity to box him a little bit more and catch him as he came back in. I caught him good with the uppercut and then the body shot, which he went down with. Then I did more or less the same after the restart, although didn’t think I had caught him quite as well as the first time, but when he got up I don’t think he wanted to know anymore, even if the ref had let it carry on. Hopefully onwards and upwards now, I’ve been talking with my team and been told we’ve got a title fight organized for May 2nd in York Hall, same night as Mayweather-Pacquaio fight, so hopefully I’ll pick up my first title, the International Masters, and bring it back to Bradford. As you can see my fans turned out in force and make a lot of noise, they’re all ringside, they love their boxing, it’s a boxing city Bradford, they just need to get more shows there. My fans are great, they travel to watch me, last time it was London, this time Liverpool and obviously it’s back to London again on May 2nd. At the moment I haven’t got the opportunity to pick where I fight, hopefully if I win the title maybe we can get a promoter to put on a show in Bradford so even more of my fans will get a chance to watch me again. I’m grateful for my team, the training went really well, I feel strong, I feel good and the fans coming out in force to support me is adding to that. My sponsors, Kingsland Business Recovery in Bradford, Broadway Solicitors in Oldham, Kesser Jewelers in Bradford and Vyomax Supplements from Manchester, have been absolutely great. These guys have been backing me up, which takes away a lot of the pressure so I can concentrate on my boxing.